Have you ever wondered what your pet would say if it could talk? Playwright A.R. Gurney did, and he wrote a play about it. The result is a funny, sweet, slightly wicked, and very entertaining story that will resonate with anyone who's ever loved an animal. 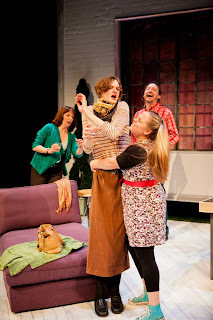 Yellow Tree Theatre is bringing back Sylvia from their first season, starring Yellow Tree favorite Mary Fox as the titular dog. It's a perfect role to showcase her many talents, and the play is a perfect fit for Yellow Tree's small and intimate stage. I've never had a dog, but one of my two cats (the one that's not named after a character from a musical), is somewhat dog-like. He always has to be next to me, he comes when I call him, he drools, he can never get enough attention, he loves everyone, and he's bigger than some dogs. Nobody loves me like my Maxie, and such is Sylvia's feeling for Greg when he finds her as a stray in the park and brings her home. 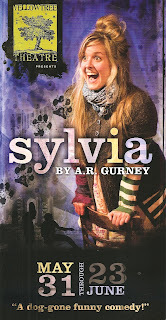 But the difference is that Sylvia can express her feelings in words, and boy does she! And the humans she interacts with can understand her, which makes for an interesting exploration of the relationship between a man and "man's best friend." Unfortunately, Greg's wife Kate is not as keen on the idea of a dog, having recently moved to the city after the kids left home for college. She reluctantly agrees to keep Sylvia, but begins to get jealous when Greg spends more time with the dog than with her. His version of a mid-life crisis is skipping out on work to walk the dog. Sylvia knows that Kate doesn't like her, and vacillates between trying harder to win her love, and flaunting her relationship with Greg. After many walks in the park, a painful spaying, heated arguments, and a therapy session, the situation comes to a head and Greg is forced to choose between his dog and his wife. Mary Fox is one of those actors that I love to watch in whatever show she's in. She's a very natural actor and is always doing something interesting. She's very expressive, and this role allows her fully explore that as she embodies all the emotions of a dog - love, fear, frustration, pain, joy. All the emotions of humans, only bigger. She's dressed in human clothes (costume design by Sarah Bahr) that match her mood - fresh from the groomer, missing her master, sore from surgery. 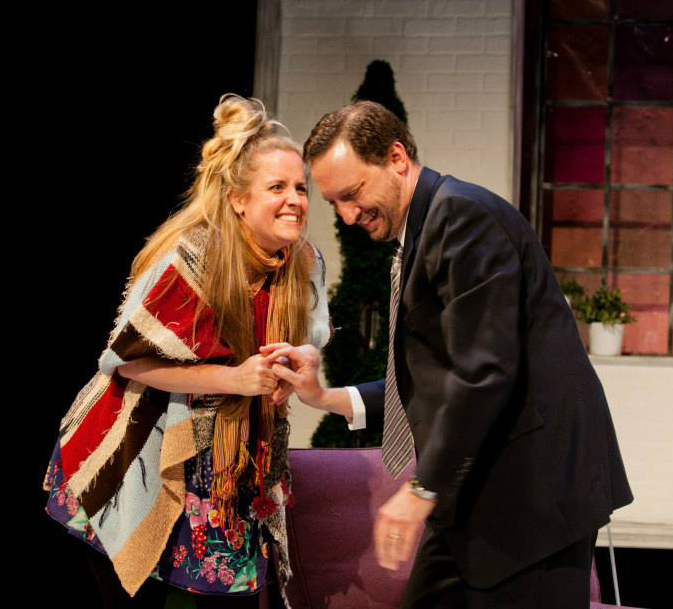 Sylvia's human family are played by Sean Byrd and Katie Wodele, who realistically portray the varying emotions of the situation. Tristan Trifft is a scene stealer whenever he appears as one of three completely different characters - the macho dog owner doing calisthenics at the dog park, Kate's cultured (woman) friend, and the ambiguously gendered therapist with some unexpected advice. As per usual at Yellow Tree, the choice of music for scene changes is perfect. From "I Want You to Love Me" and "I've Got a Crush On You" to various dog songs ("Hound Dog," "Me and You and a Dog Named Boo") at intermission. Sylvia is the final show in Yellow Tree's 5th season, which was expanded from their usual four to five shows. Judging by the packed house on a Thursday night when I saw the show, they're doing all right. It's really exciting to see a thriving theater in an unremarkable strip mall in the suburbs, and to experience the community that they've built around it. Next season looks to continue this trend, opening with the classic family drama On Golden Pond and closing with the hilarious 39 Steps. Although my theater group's favorite pre-show dinner spot, Nectar Wine Bar and Bistro, has closed (hopefully temporarily), it's still and always worth a trip to Osseo to see some great theater in a cozy and intimate setting.